Put the prawns in a bowl with 2 tbs oil, the chilli, garlic, half the lime zest, chopped coriander stalks and 2 tsp salt flakes. Mix well and leave to marinate for at least 4 hours or overnight to really get all those flavours in there. Meanwhile, for the cocktail sauce, combine the egg yolks, lemon juice, 2 tbs warm water and a pinch of salt in a tall, narrow measuring jug and process well using a hand-held blender. While continuing to blend, add 1 tbs oil to the jug and process until it emulsifies, then add the remaining oil in a thin, steady stream. Continue to blend in an up and down motion until you have an emulsified mayonnaise. Add the remaining ingredients and blend well. Season.Cover and store in the fridge for up to 3 days. Preheat the oven to 150°C. Line a small baking tray with baking paper and place tomatoes cut-side up on tray. Drizzle with remaining 2 tbs olive oil and season with salt and pepper. Place in the oven for 10-15 minutes to soften, then remove and set aside at room temperature. Heat a barbecue hotplate or preheat a grill to high. Grill the prawns for 2-3 minutes, then turn and cook for a further 2-3 minutes until slightly charred but barely cooked through. Slight charring and a just-cooked prawn is great – overcooking, not so great. Transfer the prawns to a plate. Arrange the lettuce leaves on a serving platter. 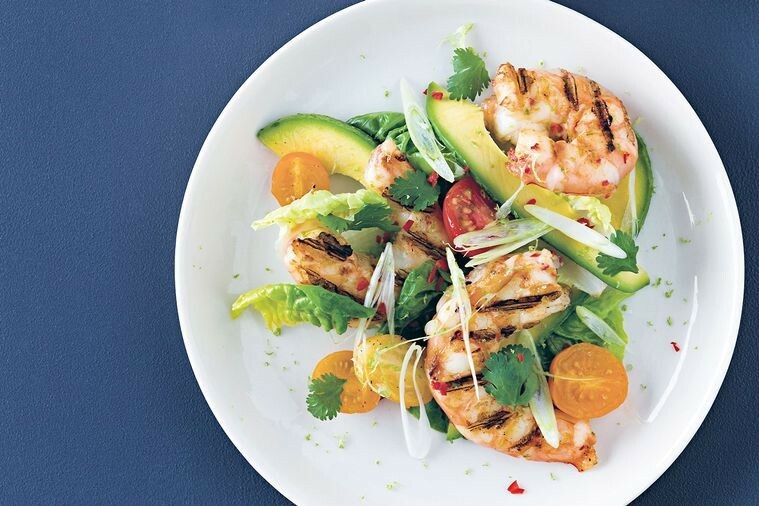 Top with the sliced avocado, tomatoes, coriander leaves and prawns. Sprinkle with the remaining lime zest and sliced spring onion and serve with the cocktail sauce.